Yesterday, after having read some of our histories of the Rochester Red Wings (SEE AT END), Nick Sciarratta Director of Corporate Development at Rochester Red Wings asked if I’d like to contribute to the upcoming 2019 Red Wing yearbook. Absolutely and we talked about some possibilities: the 2010 Stephen “Hat Gate” Strasburg game; the 2012 Bryce “Autograph” Harper game; the 2012 Andy “Pick Off” Pettite game. In addition, I had another potential story: Dustin Pedroia, a 1999 lawn chair and a 2005 birthday gift from Naomi and Anna Silver. 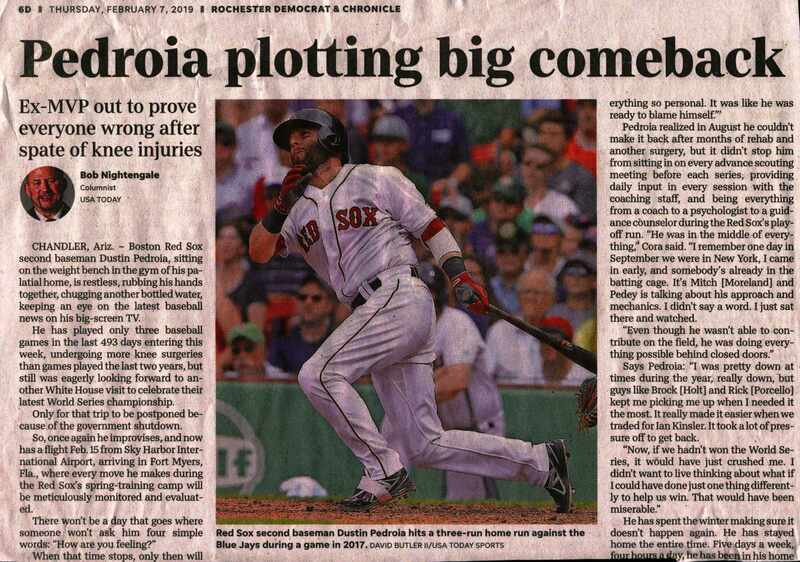 Two days ago, the Democrat and Chronicle described how the popular but oft-injured Boston second baseman is not yet giving up on his career. The story triggered a recollection. 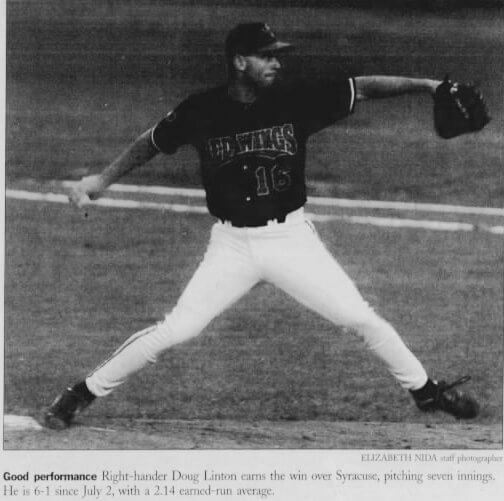 Hadn’t I watched Pedroia play at Frontier Field as a member of the Pawtucket Red Sox? 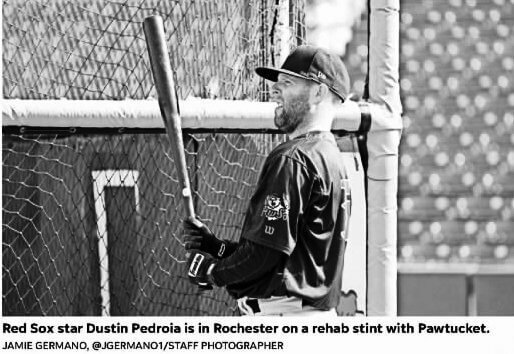 I knew it wasn’t last year when Pedroia was here on a rehab assignment. 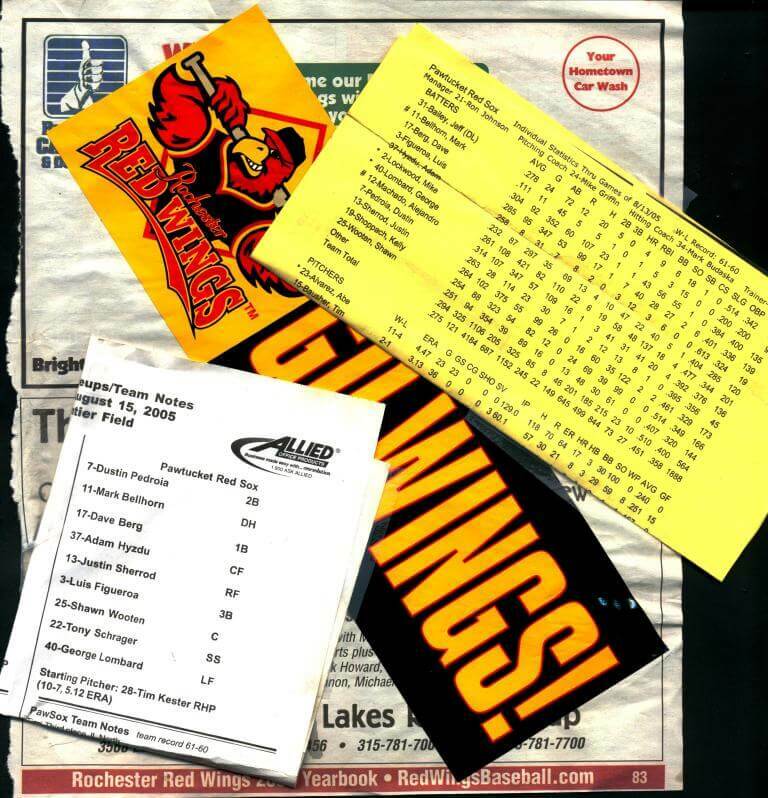 Scouring the memorabilia shelf in the attic, I found the dusty program, team inserts, ticket stubs, bumper sticker and newspaper clippings. And the date, August 15th, 2005, the day after my father’s 76th birthday. Original, the game was scheduled for Sunday the 14th, but it rained. So instead my father and I went the following day to a doubleheader. 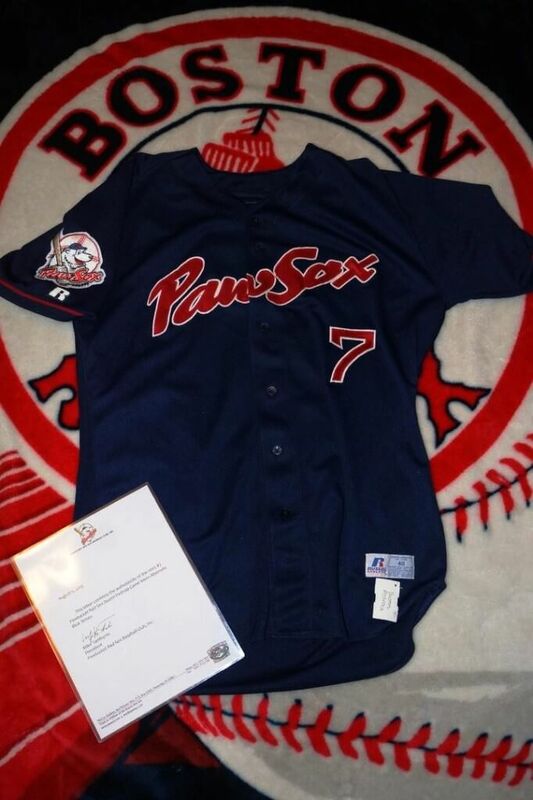 In 2005, especially as Boston had vanquished the Yankees the year before, Pawsox games drew many local Red Sox fans. Although Pedroia had not yet debuted in the majors, he was already a favorite. I went with my father and remember a few people wearing Pedroia’s jersey and ringing cow bells when he batted. 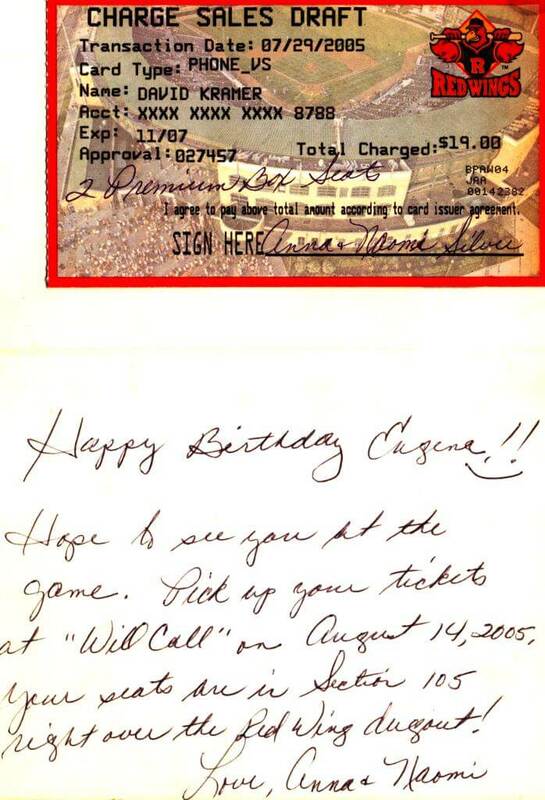 In the memorabilia envelope is one item still mysterious: a hand written note from Anna and Naomi Silver wishing my father a Happy Birthday that had contained two premium box seats tickets. To this day, no one exactly recalls why the Silvers kindly sent complimentary tickets. I have only the vaguest of memories that I may have called in advance, asking if something special — like a P.A. announcement — could be done for Eugene’s birthday. 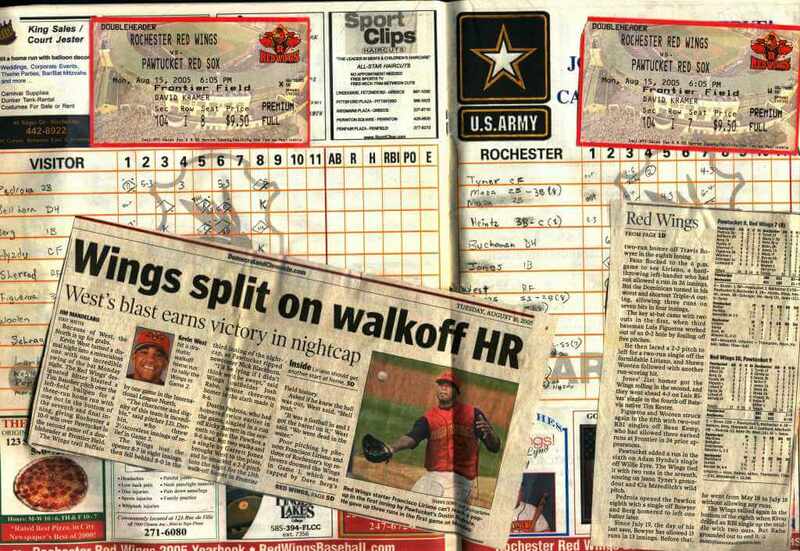 I may have also told the story of the last time Eugene had been to Frontier Field for his birthday, August 14th, 1999. 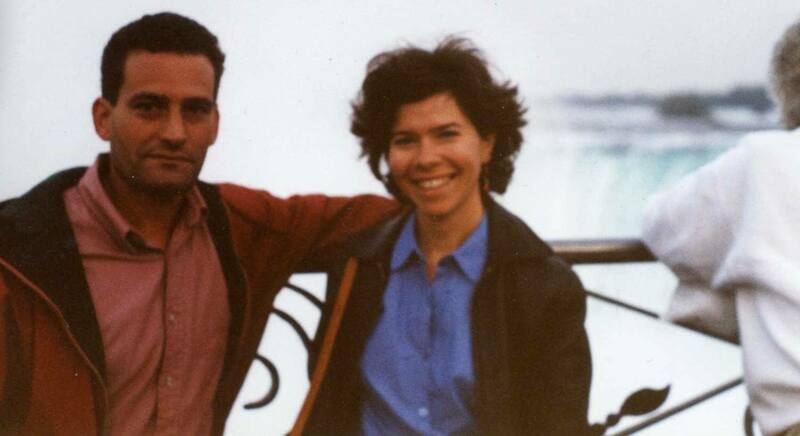 In 1999, I was living in Rhode Island and with my girlfriend Deborah (then living in Manhattan) we visited Rochester for my father’s 70th birthday. My sister also came from San Francisco and — along with my friends Dean and Dianne Tucker — we took my father to the Syracuse vs. Rochester game at Frontier won by the Red Wings 5-4. Back then, every game included a “Guess the Attendance Challenge.” During the seventh inning stretch, one randomly chosen fan guessed the size of the crowd. My father had the winning ticket stub! An usher escorted Eugene to the outskirts of the field as the scoreboard — with music blaring — displayed three numbers: the real attendance, a higher number and a lower number. I had told the usher it was Eugene’s birthday which the P.A person then told the crowd of — still unbeknownst to us — 6,630. Holding three placards, 1, 2 and 3 corresponding to the figures on the scoreboard, Eugene became a fan favorite. Yelling out what they thought was the correct attendance, most cheered TWO, TWO, TWO! Following the collective wisdom, Eugene raised the 2 placard. 6,630! 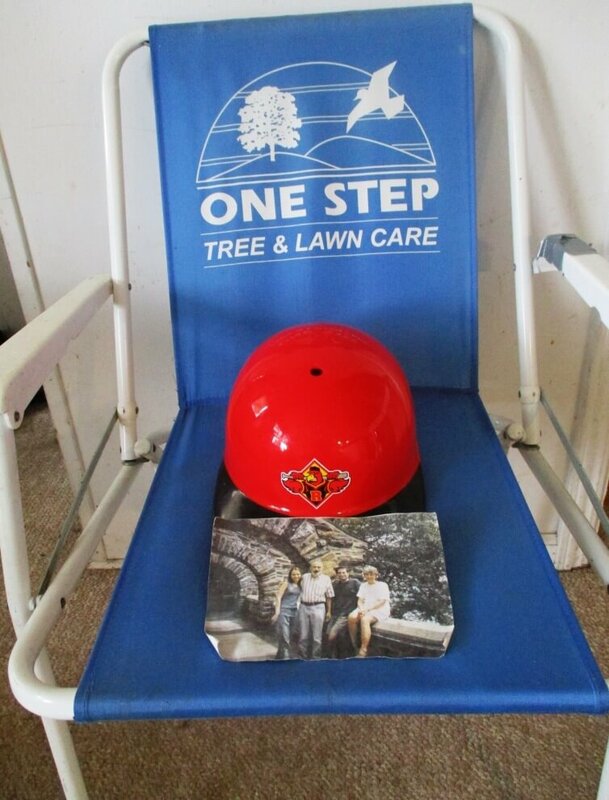 Eugene was awarded the One Step Tree and Lawn Care chair — in which he briefly sat — and a Red Wings helmet signed by Spikes the mascot. Pictured at top, both still exist. But we still don’t know why Anna and Noami sent those tickets.